Unless you have been living under a rock the past few days you must have heard about the lunacy going on at Susan G. Komen. In case you have not let me bring you up to speed. 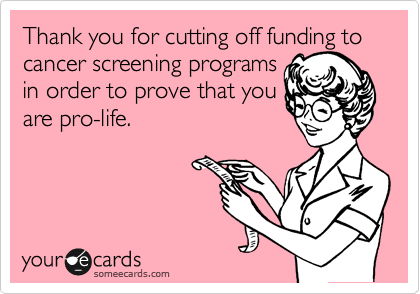 What they did 48 hours ago, and now reversed their decision, was say they were no longer going to allocate funds to Planned Parenthood. They alleged that their policies prevent them from donating to an organization that is under investigation. The general consensus was that they were not going to donate to Planned Parenthood anymore because Komen has close ties to pro-life Republicans — the details of which are neither here nor there in relation to this post. The hoopla over all of this brought me back to my thoughts on charity and how I decide who to support. I recently noticed that a lot of people my age, our age, give blindly. The obvious example being Komen, whose funds do not go towards research for a cure, they go towards “awareness”. This is why they can color EVERYTHING pink and call it do-gooding. If this is your donor style, hey, that’s fine by me. I just want more. I don’t want t-shirts, posters, toolkits and races, I want results! I am not really sure why people feel they should get something back when they make a donation. Why the t-shirt, why the big party? Why divert funds from your chosen charity? Where do you think this money is coming from? Did you ask that your donation go towards a program or administrative costs like payrolls? If you didn’t there’s a chance your donation is doing nothing more than printing flyers. I am not here to tell you where your charity should go, to each his own, really. I am stating that I have changed the way I donate. I look for organizations who are closer to the cause I want to give to, whose focuses are more narrowed on a specific cause, and I have chosen to specify where my dollars go. In 2012 I hope to help more charities bridge the administrative costs gap that haunts all of them so much. I am donating with my eyes open, I hope others will open theirs too. This is a very smart post. Not all not for profits are the touchy feelygood organizations they make themselves out to be. Do research before you donate. Ask for audited financial statements, and look at the Form 990.